With my new job and new-ish kitchen, it’s been much harder to get a lot of weeknight cooking done. 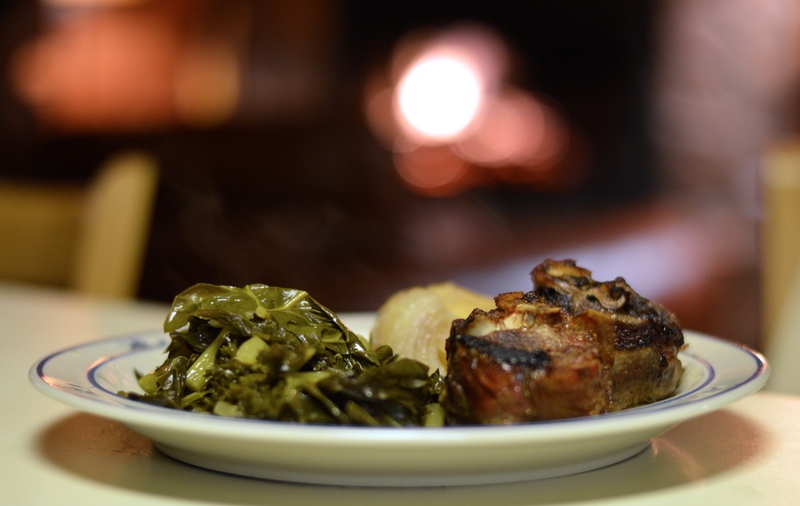 But this past weekend I made it up to the mountains, where cooking is pretty much the only thing to do. It’s already gotten cold in the Blue Ridge foothills, especially when the sun sets, so I wanted to make something that would utilize the oven for a couple of hours and warm everyone up when they ate it. I found a French lamb and potatoes recipe that acted as a kind of guide for the dish I made. And while this dish wasn’t cheap, like most of the recipes I try to put up, it was very easy and I’d recommend it to anyone looking for a lazy fall or winter evening cooking project. Honestly, this meal mostly consists of slicing vegetables. Get some yellow potatoes and slice them; then get some onions and slice them. Then slice some garlic. Layer it all in a pot, then top with browned lamb and fill your cooking dish with chicken stock – done deal. There definitely needs to be a warm fire and some heady beers to enjoy while your lamb cooks, but those ingredients are optional for anyone who hates being incredibly comfortable and content. Preheat oven to 350 degrees. 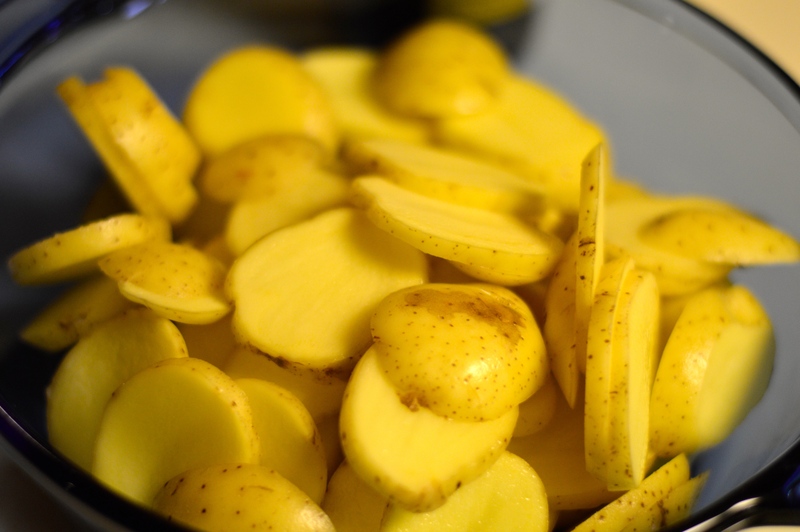 Thinly slice both potatoes and peeled onions at about 1/8″ thickness. Peel garlic and thinly slice lengthwise. Heat a round or square heavy-bottomed 9″ baking dish on the stove over high heat. Pat lamb chops dry and sprinkle salt in the pan, then sear the chops in the pan (in batches, if necessary) for 2-3 minutes per side. It’s okay to leave the lamb very rare since it will be cooking in the oven as well, but try to get a nice dark crust on the meat. 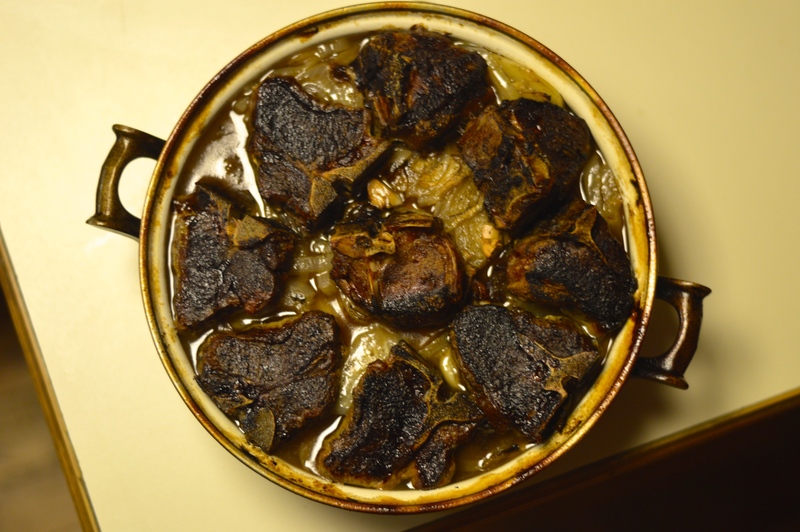 After the lamb has been browned, remove it from the pan and turn off the heat on the stove. After letting the dish cool for a few minutes, add the potatoes to the pan in one layer. Then, scatter the onions and garlic atop the potatoes. Top with the lamb, evenly spacing out the chops. Pour the chicken stock over the whole dish so until the level of stock just reaches the top of the vegetables. Place the dish in the oven and bake for an hour and a half to two hours, or until the vegetables reach your desired tenderness. *Note: I made some collard greens and kale braised on the stove with onions and chicken stock to go with this, so that’s the green stuff in the pictures.